I am not much of a fan of reality TV. There’s very little that’s real about them, to start.I also don’t like how they’re intended to play the audience like a violin. In spite of all of this, I am a junkie for Gordon Ramsay‘s shows. MasterChef. Kitchen Nightmares. And, of course, Hell’s Kitchen. It seems like every week on Hell’s Kitchen someone receives Chef Ramsay’s wrath for screwing up either risotto or Beef Wellington. In my mind, both of these have become epic challenges, so difficult nobody can get them right. Nobody. 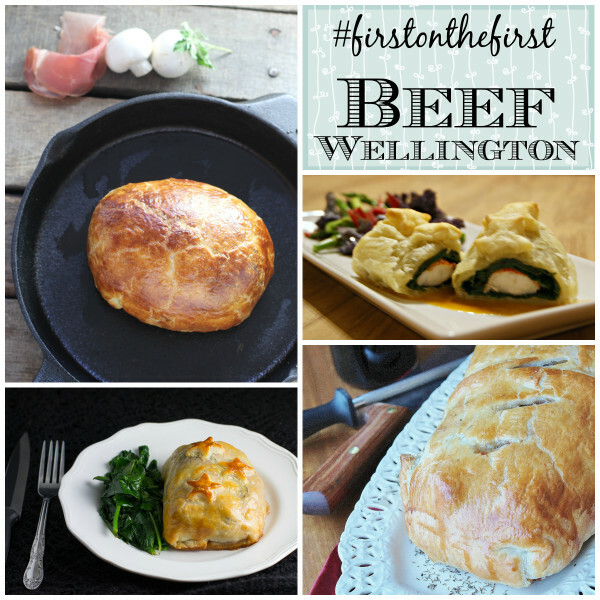 And yet, I thought it would be a great idea to make Beef Wellington the #FirstOnTheFirst challenge for March 1st. Makes sense, right? Yikes! I originally intended to make little bites of Beef Wellington–it seemed less likely I’d mess that up. But once I bought my meat–which, by the way, I have never approached the butcher in the grocery store before and certainly never spent $19.99/lb for any meat I’ve ever eaten at home–I was too terrified to chop it all up. $35 worth of beef sat on my counter in steak-form–I could not find a roast–and I started to hyperventilate. I don’t cook meat. I love it, but I don’t cook it because the stuff that sells for $7/lb seems too expensive to experiment with. This? This was insane. Finally, I gave in. Shut the TV off and immersed myself in the challenge. It was time to face my fear and go for it. 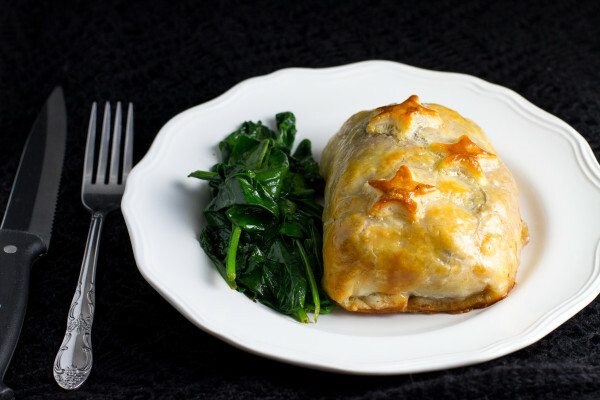 I had investigated several recipes for inspiration and even watched Chef Ramsay make Beef Wellington himself. I had this. Once my Individual Beef Wellingtons were in the oven, I watched closely. I was terrified of overcooking them, or ending up with a totally raw center. Chilling the meat in between and throwing the puff pastry-wrapped meat parcels in the freezer for a bit helps keep the beef inside from getting too well done while the puff pastry finishes. 12:30 AM and I was done. 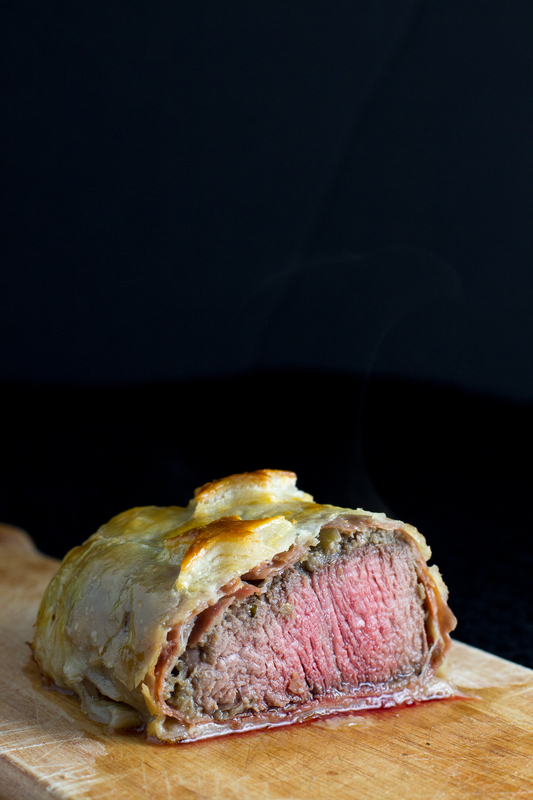 Because everyone makes Beef Wellington in the middle of the night, right? I held my breath, plated it, and adored it. Snapped some photos and then dug in. Because you can’t waste a project like this by turning it immediately into leftovers. It was uh-mazing. No exaggeration here. So tender, so rich, so salty and yet not. Wonderful. The next night (the same night?) I served the rest as leftovers to my family. Which was also nerve-wracking–reheating without overcooking. I highly recommend heating on a rack in the pan so the crust doesn’t get soggy, and in a toaster oven or oven, NOT the microwave. The kids LOVED it. They couldn’t get enough, begging for more and more. My leftover Beef Wellington was just as awesome as my midnight snack, albeit a little less glorious. YUM. So yeah, consider that challenge killed with great success. Will I ever make it again? Probably not–the anxiety level was too high and the investment was too great for a family meal. But I’m glad I tried it. And all of us enjoyed the end result. Take that, Hell’s Kitchen! Now I know you’re dying to see how everyone else did on this challenge…. …we’ll be making naan. A much more economical culinary adventure, and one I am really looking forward to. Check out the First on the First tab for more details on how to participate. Take the steaks out 30 minutes before cooking and season with salt and pepper on both sides. Set aside. In a 10-inch cast iron skillet heat 2 teaspoons EVOO over medium high to high heat. Add the steaks, spacing at least an inch apart from each other. Sear each side for 1-1.5 minutes, then remove to a plate to chill in the refrigerator while preparing the next part. Clean mushrooms and slice, then chop shallot. Add both the bowl of a food processor and chop until almost pureed. In the same skillet used to sear the meat heat the Tablespoon EVOO and herbed butter over medium heat. Add the mushroom paste and sautee until the moisture has cooked out, about 10 minutes. Add the sherry and cook until the moisture has, once again, cooked out, about ten minutes, stirring often. Remove from heat. Lay out 4 pieces of plastic wrap and lay out 2 slices of prosciutto in the center of each piece of plastic wrap, overlapping them slightly. Divide the duxelles (mushrooms/shallots) evenly and spread over the prosciutto. Remove the steaks from the refrigerator, place one in the center of each prepared prosciutto and, using the plastic wrap to assist, wrap with the prosciutto. Wrap tightly with the plastic wrap and stash in the refrigerator for 20 minutes. Preheat oven to 400 degrees Fahrenheit. Line a rimmed baking sheet with parchment paper and set aside. Divide the thawed puff pastry into 4 portions and roll them out, if necessary, to accommodate each steak. Cut squares off the corners so you're left with + signs. Set aside scraps to be cut into small shapes for accents, or saved for another project. Remove the plastic wrap from the steaks and place one in the center of each piece of puff pastry. Gather the ends so the steaks are wrapped entirely in puff pastry. Place on the prepared baking sheet. In a small bowl, whisk the egg for 1 minute. Seal the edges of the meat parcels using a little egg wash, then brush over the steak packages. Adhere any cut-out accents and brush those with egg, as well. Place in the freezer for 20 minutes. Save the remaining egg in the fridge. Remove dough packages from the freezer and apply egg wash to the dough packages again. Bake for 20-25 minutes, or until pastry is golden in color. While I have noted this serves 4, you can (and probably should) split each one into 2 servings, resulting in a total of 8 servings that are enough with side dishes. No one will feel skimped on. That is AWESOME!! I’m so happy you had such success. It looks absolutely fantastic! This was truly a challenge in every sense of the word and I loved it, anxiety and all. I am so happy you all didn’t revolt when you saw what this would cost! Totally worth the effort, though I’m not sure I’ll make it again. YAY for success with this intense challenge! I love that you had Gordon Ramsay at your side…I’m such a sucker for his shows too 🙂 And glad I’m not the only one who made it for a family meal! Great challenge, I’m so happy we conquered this. I have so few special occasions… other than every day is special with my family there. 🙂 Thanks for conquering this with us! Sounds amazing! And I think I’d have the same high anxiety level preparing it. However, it does sound like it would make for an impressive dish for a special occasion or when entertaining. I love that you made it for a family dinner! And I love even more that your children wanted more!!! It’s really not that difficult. Just focus on what you’re doing and you’ll be there in no time. My kids are becoming little gourmands. I’m in trouble. 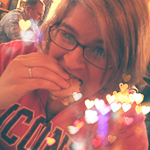 I just ate breakfast but this post is making me hungry…. Just saw this on Tastespotting. It looks amazing! So glad you came by! I was going through old First on the First posts and revisited some of your contributions. Miss you! 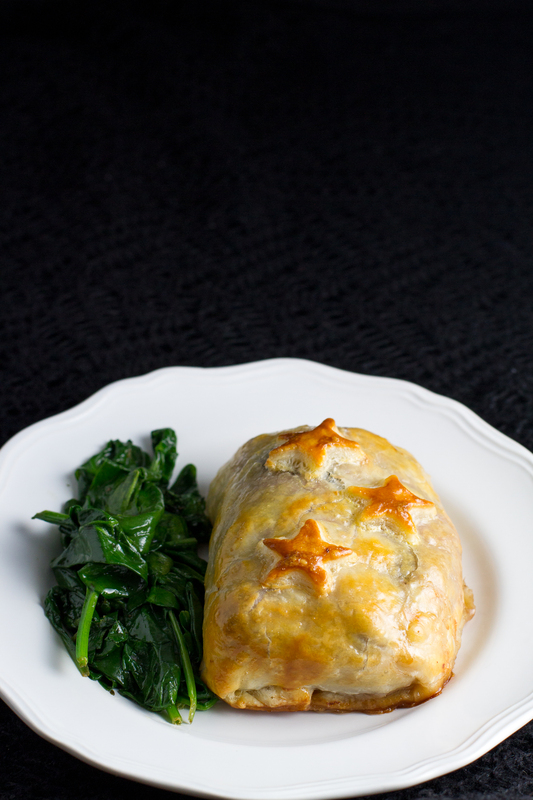 There is nothing more amazing than beef wellington! I have to agree, now that I’ve had it. It truly is amazing! You NAILED it, Carrie! I’m so happy for you, and envious, and proud, and did I mention, envious? I’ve had this on my culinary bucket list for 5 years, and I keep chickening out for the same reasons you did. ANXIETY! Don’t be afraid! If I can do it, anyone can!